The company Melben Seafood was founded By Mr. Melvin Soon (Picture) in 1979. Operating a small seafood stall in an alexander area. It soon expanded to Melben Seafood Catering Service. And in 1985, Melvin set up his 1st outlet at Pasir Ris. (Still in operation). Follow by Mellben AMK, TPY. Mellben seafood now is a family run business and we have 8 outlets( Including uncle leong’s Seafood) throughout Singapore. You may recognize us by our Mandarin name 龙海鲜螃蟹王. Singapore raves over MELLBEN's heavenly crab dishes! It needs no further introduction. Renowned for our Claypot Crab Beehoon, Chili Crab, Golden Sand Crab, many food lovers have braved storm to queue up at our heartland outlet for a taste of our crab dishes. We have more than 25 years’ experience in the crab food business. And only at our Opal and Pasir Ris Branch you will be able to get the taste of our LAKSA Crab Beehoon. Combining a local delight with our juicy Crab. A dish not to be missed!! Come to MELBEN Seafood(Mellben Legend Seafood) at 9 Opal crescent, the only place where you will find our Founder Mr. Melvin Soon. Call us for reservation now! It was here where the spark was ignited and young Melvin began his career in the food industry in a seafood stall operated by his father at Commonwealth Avenue. He was taught how to cook and how to create dishes that would make people’s mouths water. In 1985 Melvin partnered with the other half of the famous Melben name, Benson. Together they founded Melben Seafood Catering, which enabled them to focus on and perfect their craft. 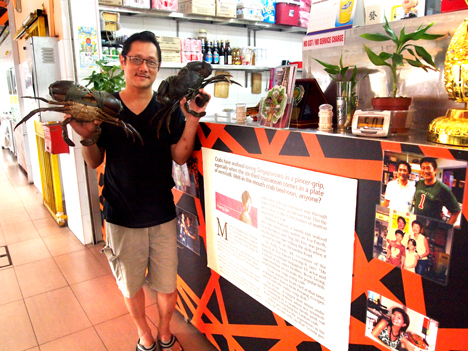 The very first Melben Seafood restaurant opened at Block 440 Pasir Ris, Singapore and the rest, as they say, is history! The chain of Melben Seafood restaurants expanded all over Singapore as they gained a reputation for having the best Chilli Crab and Crab Bee Hoon Soup in the region!Melvin & his chefs were constantly pushing the boundaries on high quality, delicious foods including their exclusive Laksa Crab, Black Pepper Curry Crab, Curry Sauce Crab, Shimmering Sands Crab and many more exciting new dishes.It wasn’t long before the local media found out about Melben Seafood restaurants and began to spread the word far and wide. Soon, people everywhere knew about Melben’s authentic taste of Singapore at affordable prices! This year, we have expanded into the manufacturing and retail side of our business offering our signature sauces for you to use in your own kitchen. When you don’t have time to visit one of our locations, you can still enjoy the unmistakable taste of Melben Seafood sauces.